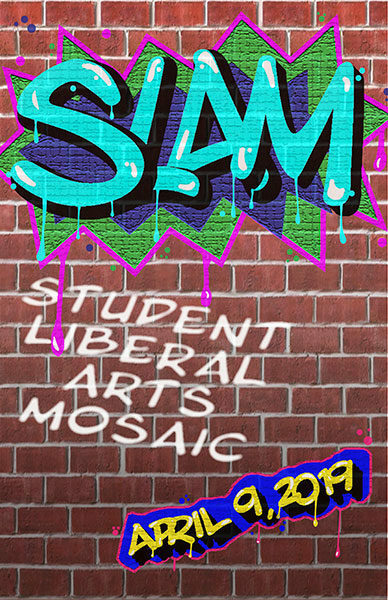 SLAM provides an opportunity for Mars Hill University students to exhibit their creativity and energy to an audience that includes not only the entire campus community (students, faculty, and staff), but also the wider university family (trustees, alumni, and friends of the university). During the sessions and panels of SLAM, students present the best of their work in a wide variety of subject areas and formats, sharing it in a spirit of intellectual cooperation. is a showcase of student research, performance, and creativity. provides an opportunity for the Mars Hill University community to celebrate, recognize, and promote student accomplishment across a range of academic pursuits. fosters and encourages a campus culture that honors and rewards the hard work, dedication, and discipline that lead to success and achievement in liberal education, in professional life, and in the world. The Spring SLAM provides an opportunity for Mars Hill University students to exhibit their creativity and energy to an audience that includes not only the entire campus community (students, faculty and staff), but also the wider university family (trustees, alumni, and friends of the university). During the sessions, panels, and exhibits of the Spring SLAM, students present the best of their work in a wide variety of subject areas and formats, sharing it in a spirit of intellectual competition and cooperation. When does SLAM take place? What happens to regularly-scheduled classes? Am I required to attend SLAM? What types of research, performance, and creative projects are eligible? Can AGS students submit proposals? Do presentation proposals need to be associated with courses in which students are currently enrolled? Are only single-student proposals eligible? How do students submit a proposal? What if I have questions that have not been addressed in this FAQ? Tuesday, April 9, 2019. The events begin at 9:15 a.m. and continue until 4:00 p.m.
All regular day classes will be suspended and replaced with a schedule of opening and closing ceremonies, concurrent sessions, panel discussions, performances, and exhibitions. Not necessarily, but it’s highly recommended. SLAM attendance is a requirement for many MHU classes. Check with your individual professors for information about how your attendance will be evaluated. Spring SLAM is designed to celebrate, recognize, and promote student accomplishment across a wide range of academic pursuits. Any student project that reflects the spirit of intellectual pursuit can be proposed. Any currently-enrolled student or December graduate can submit a proposal. Absolutely. Students in the Adult & Graduate Studies program are valued members of our academic community, and we welcome their participation. No. Student research, performance, and creative endeavors from past semesters are eligible, as are projects that students have pursued for the sheer joy of learning. No. Joint and group projects also represent the intellectual passion and curiosity that we are celebrating. The submission and evaluation process is explained on the “How can I present at SLAM?” section of the SLAM myMHU page. Please contact any of the members of the Spring SLAM committee, listed in the Contact section of the SLAM myMHU page.